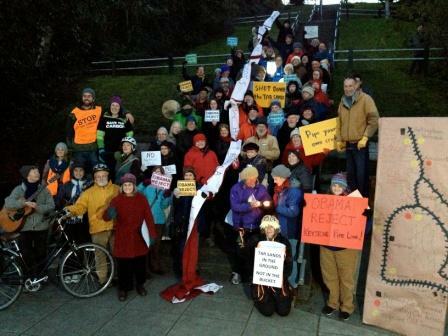 As part of a national day of protests, Olympic Climate Action in Port Angeles and Fossil Fuel Action in Port Townsend conducted rallies on February 3, calling on President Obama to reject the controversial Keystone XL pipeline following the release of the State Department’s flawed Final Supplemental Environmental Impact Statement. Thanks to all who braved the chill night air! We were even featured in The Nation magazine’s online article about the nationwide rally. The proposed Keystone XL pipeline, which would run from Canada through the central United States to refineries in Texas, is central to the extraction of the massive fossil fuel deposits in the “Alberta tar sands”. However, in its final environmental statement, the U.S. State Department fails to recognize this, saying the pipeline will have no significant environmental impact in regard to greenhouse gas emissions. The State Department believes all this oil will get burned one way or another. We mourn, because extracting the fossil fuels in the Alberta tar sands means “game over” for the climate, as NASA scientist James Hansen has said. 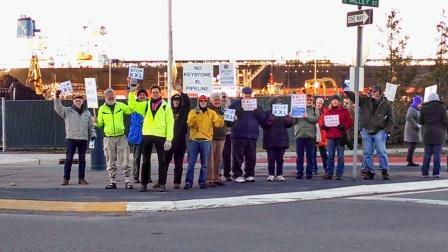 We chose to vigil in this location in front of the Port of Port Angeles office to remind ourselves that parts of the fossil fuel extraction infrastructure are here in our community, not just far away in the oil fields. Port Angeles harbor has been a working harbor for millennia. Work does not depend on oil. Rather, we recognize there are no jobs on a dead planet. We are for a sustainable world, one where all people, both now and into the future, have access to a decent livelihood. There is work to do conserving energy and producing it more sustainably. We cannot let the oil age preclude a future for our descendants. 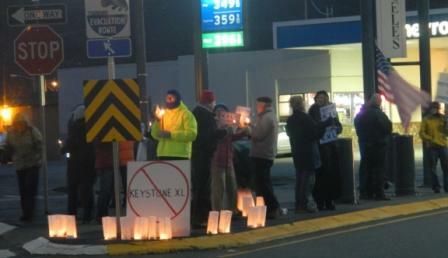 This entry was posted in Actions, Events and tagged Keystone XL, Port Angeles, Port Townsend, protest on 2014/02/07 by olyclimate.